How to Care for and Plant Bareroot Trees and Shrubs? 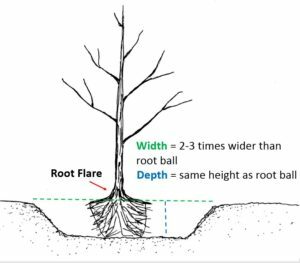 Dig hole only deep enough to reach root flare (place where roots start to come off of trunk) but wide enough to allow roots to reach straight out. Do not curve roots in hole. Do not bury the graft! This could cause the rootstock to start sprouting which takes energy away from the top of the tree. Here are some great articles for more detailed information.